Be the eyes and ears for The Takeaway in your neighborhood! 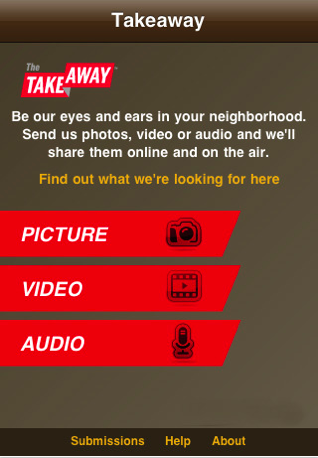 Send us videos, audio or images straight from your iPhone to Takeaway producers and we'll share them online and on the air. Check the app for assignments (or listen on air) and sign up for texts to help start the conversation every day. The Takeaway is a co-production of WNYC and Public Radio International, in collaboration with The BBC World Service, New York Times Radio and WGBH Boston.